A unique family event that brings together great music for the family in Spanish and English. 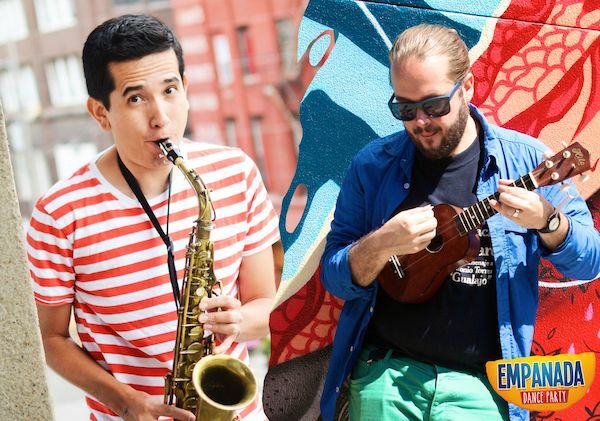 123 Andrés and Sebastian Cruz join forces at Terraza 7 to shake things up with original music that connects people of all backgrounds. Contagious music and delicious empanadas make this an unforgettable event for the whole family! Two-time Latin Grammy nominee, 123 Andrés has been called “A rockstar for little language learners” by to Billboard Magazine. A native of Colombia, his two CDs and his live performances are infused with south of the border sensibilities. Andrés brings to audiences joyful sounds, passion for bilingualism and a high-energy love of music that gets kids singing and dancing in Spanish and English. Sebastián Cruz and the Tiny Giants invites us to stomp like Giants, fly like butterflies, and dance with abandon. Sebastian’s band offers a celebratory, fun, and original collection of beautiful children’s songs. With Sebastián Cruz on voice and guitar, Martín Vejarano on drums and Edward Pérez on bass. $7 admission for children 12 and under. No Replies to "“Empanada Dance Party”"